Are You Aware? New Global Causes of Child Mortality & Breastfeeding. Not all people can afford to have their children vaccinated at a private clinic but I must say some are just so thrifty that they avail vaccines from health centers for free, then catch up at a private clinic for what’s not been provided. I don’t mind and I actually appreciate these parent’s reasons and practicality. I often do not have conflict of schedules except for the last (third) dose of hepatitis B vaccine. 3rd dose: minimum interval from the 2nd dose is 8 weeks but it is emphasized that the final/third dose should not be given earlier than 24 weeks. If given earlier, it should be readministered. The problem with health centers is that they schedule the 3rd dose to be given 4 weeks after the 2nd dose. I instruct my patient to insist in health centers that the 3rd dose should be given by 6 months of life. Some do oblige but yesterday, one of my patients was insistently given as it is their “mandate” to do so. The other health workers who listen to my patient’s prodding learn, while those who are close minded just blindly follows the antiquated recommendations shoved into their system by whoever is responsible. Another confusion comes when dealing with low birth weight infants and/or weighing less than 2 kgs. The recommendation depends on the maternal hepatitis B status. test baby for HBsAg and anti-HBs at least 2 months from the last dose of vaccine but not earlier than 9 months of life. if mother turns out positive for hepatitis B infection, test baby for anti-HBs and HBsAg as scheduled above. delay 1st dose of hepatitis B vaccine until 1 month or hospital discharge provided weight is at least 2 kgs. Infants younger than 6 months may experience higher morbidity and mortality rates from influenza than those 6-12 months old. The United States Advisory Committee on Immunization Practices (ACIP) currently recommends that pregnant women receive influenza vaccination, but the recommendation is owing to potential influenza morbidity while pregnant. It is less clear whether maternal vaccination against influenza during pregnancy provides protective benefits to the infant after birth. This study evaluated whether maternal vaccination against influenza during pregnancy protected the offspring. The participants were Navajo Indian and White Mountain Apache Indian children. 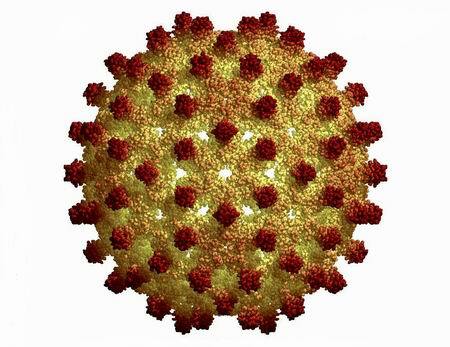 The study was conducted from 2002 to 2005, covering 3 influenza seasons. The study population was chosen in part because Native American infants experience higher rates of influenza morbidity, and influenza vaccination rates among eligible pregnant women are generally less than 10%. Eick and coworkers collected demographic information from the mothers through the use of a questionnaire that included information on breastfeeding, influenza risk factors, and the influenza vaccination status of household contacts. The primary outcome of interest was whether the infant experienced influenza-like illness (ILI) during the first 6 months of life. An ILI was defined as a medical visit with at least 1 of the following findings: fever of 38°C or higher, respiratory symptoms, or diarrhea. The investigators identified visits meeting these criteria by reviewing visit records at Indian Health Service sites and nearby private facilities during the respective influenza seasons. In addition to visit surveillance by the investigative staff, mothers were encouraged to contact the investigators whenever they made a medical visit for respiratory, diarrheal, or febrile illness. This voluntary reporting was supplemented with chart review. Serologic studies were obtained from the mothers within the first 14 days after delivery. Infant samples were obtained from umbilical cord blood, within 14 days of delivery, again when infants were 2-3 months old, and a last time at 6 months of age. In addition to evaluating the effect of vaccine on ILI, the investigators evaluated the effect of vaccine on laboratory-confirmed influenza, which could include influenza-positive nasopharyngeal aspirate specimens, a 4-fold rise or greater in influenza antibodies, or a positive rapid influenza test. The investigators initially attempted to adjust for potential confounders such as tobacco exposure, daycare attendance, and breastfeeding, but these variables were not related to outcomes. The investigators enrolled 1169 mother-infant pairs. Approximately half of those (n = 573) were born to mothers who had received influenza vaccine during pregnancy. An episode of ILI occurred in 908 (77.6%) infants, 17% of the children were hospitalized for an ILI, 36% had ILIs requiring only outpatient care, and 48% had no ILI episodes. Among the 605 cases of ILI, 83 (14%) had laboratory-confirmed influenza. When comparing children born to mothers who had received vaccine with children whose mothers who had not received the vaccine, investigators calculated a 41% reduction in the risk for laboratory-confirmed influenza virus infection. The relative risk was 0.59; 95% confidence interval (CI) 0.37-0.93. No protective benefit against ILI was evident (relative risk [RR], 0.9; 95% CI, 0.73-1.16). There was a 39% reduction in risk for infants born to a vaccinated mother when the investigators restricted the analysis to severe ILI requiring hospitalization (RR, 0.61, 95% CI, 0.45-0.84). They concluded that vaccinating pregnant women against influenza was associated with a 41% reduction in the risk for laboratory-confirmed influenza virus infection and a 39% reduced risk for ILI requiring hospitalization. The researchers commented that it was not clear whether this protective effect resulted from reduced influenza illness among the pregnant women or whether antibody benefits are extended to newborns. However, they did find higher anti-influenza antibody levels in infants born to vaccinated mothers, suggesting that some of the benefit was indeed from transferred antibodies. In an accompanying editorial, Ortiz and Neuzil comment that influenza vaccination rates in pregnant women in the United States are poor despite recommendations by ACIP. As pediatric providers, we have an important role in helping expectant mothers understand everything they can do to help their newborns and young children grow and develop safely. Focusing on maternal vaccination that may protect newborn infants, such as vaccination against influenza and boosters of pertussis vaccine, gives us a chance to make a real difference in the early lives of these newborns.